The Mandarin Museum and Historical Society is partnering with the Mandarin Community Club in an effort to save the oldest remaining one room schoolhouse in Duval County and relocate it to Walter Jones Historical Park in Mandarin. The schoolhouse was built in 1889 as part of a mission established by the Sisters of St. Joseph in Mandarin to educate freed Blacks after the Civil War. The building was originally located on the property of the present day St. Joseph's Catholic Church. In celebration of its 90th anniversary, the Community Club is working to purchase the structure with the intent of donating it to the City of Jacksonville. Emily Lisska, Mandarin Community Club President and Executive Director of the Jacksonville Historic Society, is excited about the opportunity. "The Mandarin Community Club is pleased to have the opportunity to help save this important piece of Mandarin history," Lisska said. The organizations hope to identify sufficient funding to be able to move the structure to the park this spring. Once moved and all renovations are complete, the schoolhouse will open to the public and will contain exhibits about the African American educational experience from the late 1800s to mid-1900s. 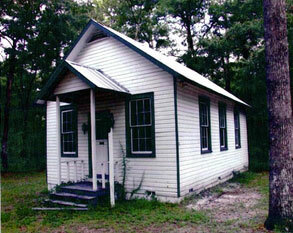 Mandarin historical society want to relocate this one-room school house to Walter Jones Historical Park in Mandarin. The Mandarin Museum and Historical Society is managing fundraising efforts for the project. To date, nearly 90% of the monies needed has been donated, including $40,000 from City Councilman Matt Schellenberg's District 6 funds. Additional funds are needed to complete preservation efforts, meet ADA compliance standards, construct sidewalks and develop exhibits. Donations should be made by a check to the Mandarin Museum and Historical Society, PO Box 23601, Jacksonville, FL 32241 or click here to donate through our website. More information can also be found at our Facebook page here. The Mandarin Museum and Historical Society, located in Walter Jones Historical Park, is a registered 501 (c) (3) with experience in maintaining and preserving significant historical structures. We currently operate the Mandarin Museum, the historic Webb Farm House, the 1876 Barn, and the 1911 Store and Post Office. The Historical Society brings history to life through school tours, programs, and community events.